Like prophets of scripture, Joseph was experiencing rejection, ridicule, and disappointment from those “even who ought to have been his friends.” The lack of support must’ve left him very discouraged. 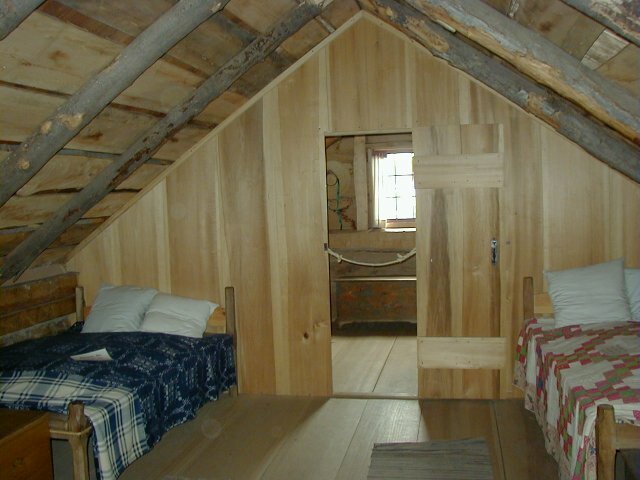 He surely felt very alone as he approached the Lord on this night of autumnal equinox, although surrounded by his siblings who all shared the same bed in that tiny loft of the Smith residence in upstate New York. Interestingly, it does not appear from the record that Moroni spends a lot of time consoling Joseph nor does he pull up a chair and listen to his concerns. 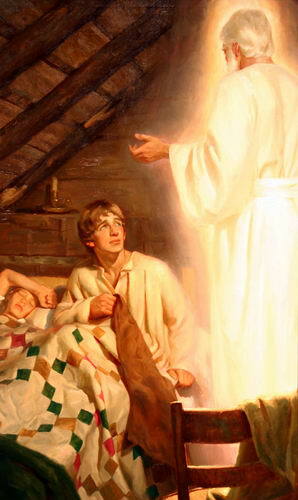 Moroni is laser focused on the message he has been commanded to deliver to young Joseph. Why did Moroni come four times? Why not three? Why not five? Why would he then ask Joseph to appear on the same day (the Autumnal Equinox) for the next four years at the Hill Cumorah? What was the significance of the number four, if any? What is also interesting is that since 1823 there have been many “blood moons” and “solar eclipses.” Assuming this is what is meant by the references to blood and darkness. Does anyone else find it odd that Moroni is quoting prophets from the Old and New Testament saying the time of burning is soon at hand, and oh by the way, it won’t happen before a blood moon and solar eclipse, when such a thing is not very unique? Unless of course, it’s four blood moons and a solar eclipse. What if Moroni was leaving Joseph a message with the emphasis on the number four? Many of you are aware that we are living history this year as it pertains to Blood Moons. We are experiencing what is called a Tetrad of Blood Moons. It’s not the first Tetrad we’ve seen since Christ’s first coming. But, all the Tetrads have been during years of great significance for Israel. There is so much more here to study and to see and to ponder. I found an intriguing article written on this topic by a person not of our faith. He speaks of a prophecy by a Rabbi Judah Ben Samuel in 1217 AD. I definitely think it’s worth a read. I’d love to hear your thoughts. As I read and ponder such things I am reminded that our Lord must soon be coming. It has been nearly 200 years since Joseph’s first vision and since that first visit from Moroni! I often hear people in the church say they “can’t wait until He comes again!” I don’t know that I share that same sentiment. He and those that come will destroy many of us. Or their glory will at least. I feel the need to repent and to become more prepared before He comes. To be a better husband and father, son and brother. To be more humble, more trusting in Him. I need His grace and seek His fulness. I know many of you may relate to Joseph in feeling discouraged at this time, by rejection from those who ought to be your friends. God bless you. I know God hears your prayers and will comfort you as you turn to Him. I leave you with a beautiful version of a song I wish was in our hymn book. 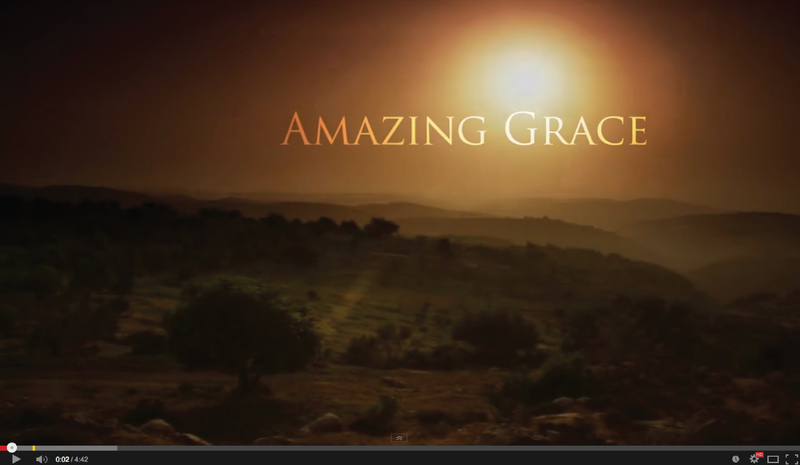 Amazing Grace. I have heard it’s not included in the hymnal for doctrinal reasons, although I notice the Mormon Tabernacle Choir has sung it on occasion. Either way, I hope you enjoy it. It really is all about His Amazing Grace. This entry was posted in Main and tagged Blood Moons, Less than Dust, Second Coming on January 2, 2015 by Bishop Anon. What is the purpose in God sending “a great earthquake; and the sun became black as sackcloth of hair, and the moon became as blood” (Rev. 6:12) and “The sun shall be turned into darkness, and the moon into blood, before the great and terrible day of the Lord come.” (Joel 2:31)? If it is as a sign only to people who are looking for signs from God (a few Jews, evangelicals and Mormons), then eclipses and blood moons, (and perhaps a small earthquake in an out of the way place) would be the reason for this prophecy. If God is trying to call the world to repentance, in the hopes of saving more than a few Jews, evangelicals, and Mormons, then a massive earthquake, followed by, say, a lot of volcanic ash, that makes the moon appear red and darken the sun, would be the reason for this prophecy. Incidentally, Christ did not come in 3 Nephi 8 after blood moons and a solar eclipse, but rather after 3 days of darkness and “exceedingly great quaking of the whole earth” (v.12), among other destructions. I’ve seen this picture of the blood moons and single eclipse floating around. 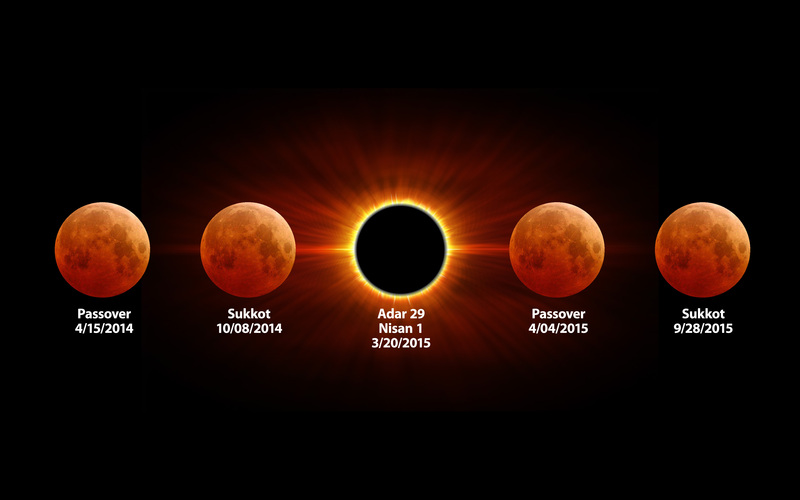 It should be augmented by the two full solar eclipses that happen after the last blood moon. It presents a slightly different pattern. The penultimate solar eclipse is almost exactly a year from the one in the graphic on this post: 3/8/16. The next is 8/21/17. The trajectories of the eclipses are, I expect, connected to what they portend. the link to the youtube video does not work. Thanks for letting me know. I’ll check the link now. Thanks for the clarifications Rob. I’ll look forward to your comments on your site. Undoubtedly things are afoot. I find it very interesting that you mention 5 signs and then attach the song “Amazing Grace” which is a slave song sung by those captured and transported into slavery. It was a captain of one of the slave ships which penned the melody, probably as he heard it coming from those soon to be sold slaves, from the bowels of the ship. The first writing of the melody was done in the pentatonic (five note) scale. That is a scale of just five notes, usually the black keys of the piano. Amazing Grace can be sung just using the five black notes of the piano and all within the span of an octave, starting on the note C#. Five signs, five notes. Coincidence? i’m not sure why but this is one of the most inspiring posts i’ve read in a long time. not that it is the most eloquent. or the deepest. or most original thought. and i don’t think because of an implied call to urgency so as not to be like 1 of the 5 virgins buying oil at the last moment. i like the post for all of the attributes to whatever degree that are eloquent, deep, original, or warning. but i think – though i’m not honestly sure – what stirs me most about this post is that there is no negativity in it that i can see or sense. it feels peaceful. and maybe for me that’s just what i needed. Grace through Christ. 5, the number of the covenant pattern. The signs in the heavens diagramed in this post are only a small portion of those that God will cause to happen. The others include massive earthquakeS, probably volcanic ash, and many others. 5 IS the scriptural number for Grace. I noticed that often those who say “can’t wait until He comes again!” are also those who do not understand the role of the New Jerusalem. That it will be built up BEFORE the Second coming and will be a place of peace and refuge for the saints of God while the calamities will befall the wicked. I find this post very fascinating and definitely worth pondering. I can not help but ponder the days we live in. My entire life has been filled with those who believed that we were either very close to the end or that the end time was here. Personally, with all of the wars and rumors of wars in the Middle East, I have felt to prepare. The info you gave in your wonderful piece here, combined with scripture brings me closer to believing this may be true. Thank you for the link and youtube video. Such a beautiful piece of music! Your climaxing this excellent Commentary with Amazing Grace is so profound. I have spent hours and hours listening to YouTube versions (good ones) if this hymn. It’s invitation from one who has found grace to learn for onesself is so incredible. As we have witnessed the blood Moons and the darkening eclipse (personally), I am in awe of God’s power and generosity. He brings heavenly bodies into totally obedient alignment to evidence both his grace in calling us to repentance and his honor (Isaiah) to his faithful servants. Bishop Anon, why can’t the saints by majority see we have been engaged in last days events for some time. My heart goes out to them as we will soon commence the desolations and destructions. Because you have mentioned a Rabbi, I want to cite the John the Baptist voice and determination of Rabbi Jonathan Cahn (a messianic Jew). His repeating invitations aloud to those in power to repent, to save christians and to know without reserve that the purging is about to commence us unparalleled. His voice at the President’s breakfast, at the UN and other places makes LDS lack of voice painfully obvious. Thank you for this commentary and for your spirit of awakening.